I admit that I did not plan to write this blog. I mean, EVERYONE knows at least the basic facts about jewelry tools, right? Well, just when I started to think that, I ran across another confused customer. They brought me a broken piece for a super simple repair. Not that I mind doing simple repairs at an event, but what if you have a simple repair when I am not around? First we need to understand a few jewelry tools and what everyone should have on hand as a part of their own home jewelry repair kit. Your tools do NOT need to be expensive. If you only do a few repairs a year, an inexpensive set of tools from a hobby store are more than adequate. 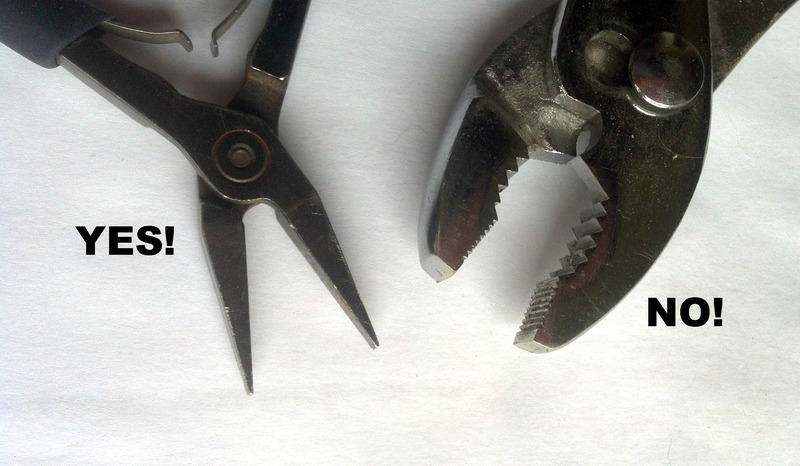 A set of pliers and a cutter will do most of the jobs that you need to do. If you decide later that you are going to be doing large amounts of jewelry work, you can always upgrade. Professional grade tools often have better quality work surfaces and more ergonomic handles. NOTE: The most important rule for jewelry pliers is that they must not have metal grooves on the inside of the jaws. Regular hardware store pliers often have these grooves. The grooves are designed to dig into the metal and help provide traction, but they can ruin jewelry by marring the surface and peeling off plated coatings like color or gold plating. I admit that I have done an emergency repair with regular pliers – just wrap the jaws of the pliers with masking tape and use them VERY gently. There are a virtually unending variety of styles of pliers. Pliers with straight ends, curved ends, ends bent at various angles, and pliers with different shaped blades. So what sort of pliers do you need? Well first you need to understand the names of the pliers. Pliers are usually named according to the shape of their jaws. This is a picture of one of my favorite pairs of pliers. These are called flat nose pliers because the ends of the jaws are, you guessed it, flat. 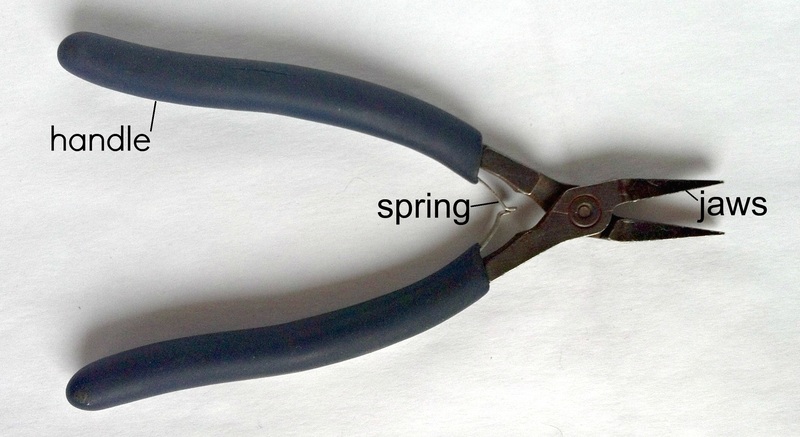 You will notice that this particular pair of pliers has a spring that helps them open after they have been used. This makes a big difference if you are doing a lot of work. 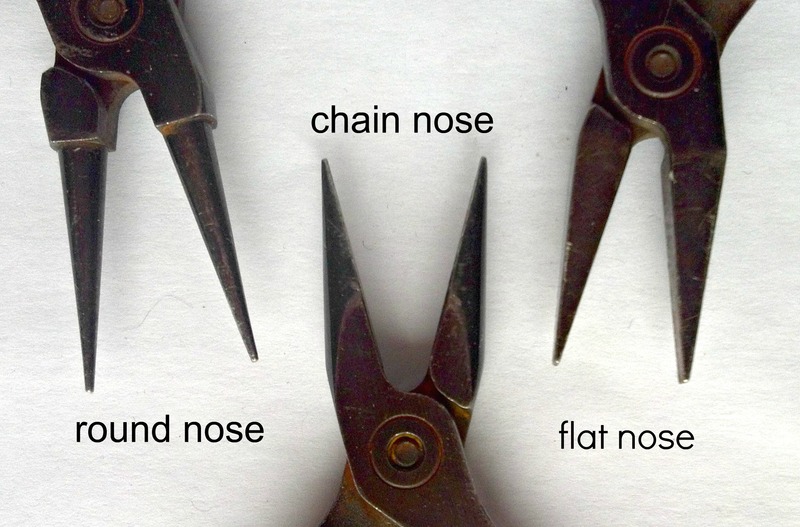 This next picture shows the three most basic types of pliers: flat nose, chain nose, and round nose. The flat nose is flat on the inside, the end and the outside. The chain nose comes to a point on the end, is flat on the inside and rounded on the outside. The round nose comes to a blunt point and the jaws are conical (round with a taper). So, if I had to purchase just one pair of pliers what would I buy? I would buy a pair of chain nosed pliers. Why? They are pointed, so they will reach into tight areas, and they have a flat interior area, so they can easily be used to align pieces of wire or carefully straighten a piece of bent metal. What is the ideal small collection of tools? A pair of round nosed pliers, a pair of chain nosed pliers, a pair of flat nosed pliers and a side cutter. The round nosed pliers will allow you to easily bend a piece of wire into a circle, or repair the bend on an existing piece. The chain nosed pliers will get into tiny spots for opening or closing, or smoothing, metal or wire. The flat nosed pliers will help you close jump rings and smooth larger areas of metal, and the side cutters will cut wire, and head pins.